Critical thinking skills have always been important to the process of searching for and using information from media such as books, journals, radio broadcasts, television reports, and so forth. With the advent of the Internet and the World Wide Web, these skills have become even more crucial. Traditional books and journal articles need to pass some kind of editorial scrutiny before being published. Web pages, however, can appear without a single person ever reading them through to check for accuracy. Libraries have collection development policies that govern what material they will and will not buy; the Internet and the Web, having no such policies, collect anything. This isn’t to say that there isn’t information of high quality on the Internet. There are thousands of high-caliber Web sites and well-regarded databases. It is your responsibility to decide whether a page or site is worth selecting and then determine, using well-established guidelines, whether the information is worth using in your research paper, project, or presentation. You might also be interested in reading Thing 6: Evaluating Information Found on the Web. That page is part of the "15 Things" approach I take to teaching people about the Internet and Web 2.0. It contains some of the material from Chapter 2 of Searching and Researching on the Internet and the World Wide Web 5th Edition. We use the information found on the Web for a variety of purposes. Sometimes we use it for entertainment, recreation, or casual conversation. When we use it for research, to bolster a belief, or to choose a particular course of action, we have to be sure the information is reliable and authoritative. That puts us in the position of having to verify the information and make judgments about its appropriateness. Reliable information is one of the most important things in life. In order to make decisions and understand our world, we need the most truthful information that we can find. The nature of the Internet and the World Wide Web makes it easy for almost anyone to create and disperse information. People also have the freedom to design their pages to advertise products or disseminate propaganda unnoticeable within the context of a research report. To think critically about information and its sources means being able to separate fact from opinion. We have to be able to verify information and know its source, we have to determine whether the facts are current, and we need to know why someone offered the information at all. In some situations, we don’t have to do all the work ourselves. Some librarians and other information specialists have established directories on the Web in which the listed sources have been reviewed and evaluated. Still, when you deal with any information you find on the Web or in a library, it is up to you to be skeptical about it and to assess whether it’s appropriate for your purposes. For example, if you want information before buying a new computer, then product announcements from manufacturers will give you some data, but the announcements will probably not be the right source for impartial brand comparisons. If you’re researching techniques for advertising electronic consumer products, then the advertisements might be good resource material; if you are writing about the physics involved in producing sound on a MacBook, however, these ads may not be authoritative sources. Once you find some information, regardless of whether the resource is a book, journal article, Web page, or data from a commercial database, a librarian can help you evaluate its usefulness and quality. Librarians, particularly reference librarians, are trained professionals who have lots of experience with evaluating resources. They can usually tell you within seconds if information is relevant, authoritative, and appropriate for your research needs. The World Wide Web gives us access to a great variety of information on many different topics. When we want to use the resources we find on the Web for information or research purposes, we need to exercise some care to be sure it’s authentic, reliable, and authoritative. We need to be equally cautious when we use other sources. Print sources that are available to us through a research or academic library have often been put through a screening process by professional librarians. There are several directories that contain evaluated resources on the Web, and it’s useful to consult some of these libraries when doing research. Information in many directories tends to be evaluated before it’s listed. Plus, by consulting these directories, we can also observe how librarians and other information specialists evaluate resources. It pays to be skeptical or critical of information we want to use. It’s relatively easy to publish information on the Web, and it can be presented in such a way as to hide its intent or purpose. Generally, as we evaluate documents, we also learn more about the topic we’re considering. Assessing resources makes us more confident of the information and helps us become better versed in the topic. Who is the author or institution? Is the content accurate and objective? Look for the name of the author or institution at the top or bottom of a Web page. Go to the home page for the site hosting the information to find out about the organization. To find further information about the institution or author, use a search engine to see what related information is available on the Web. Use Google Groups to search archives of discussion group articles. This way, you can find other information about the author or institution. You can also find out if the author has posted anything to a group. Check the top and bottom of a Web page for the date on which the information was last modified or updated. There are a number of Web resources that can help us evaluate information and that discuss issues related to assessing documents, and we have included many of the best in this chapter. 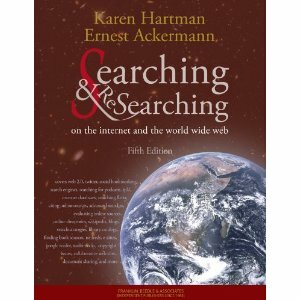 Searching and Researching on the Internet and the World Wide Web 5th Edition. Published by Franklin, Beedle & Associates Inc. This site is hosted by Webliminal.com, a site on one boundary of the Web.